Raisins. Sundried tomatoes. Mushrooms. Fruit leather. Jerky. Each one of these ingredients or food products has undergone a drying process. Throughout history and around the world, people have dehydrated fruits, vegetables, meat and fish as a form of preservation. It was a means to prolong their food supplies or make it easy to take with them over land and sea. As water and juices are drawn out, the food pieces shrink (and sometimes shrivel), which made the dried foods ideal for travel because they were safely preserved and didn’t take up much space. Although preservation is still a predominant reason why people dehydrate foods today, they also do it for flavor. When the moisture is pulled out, the flavor remains. In fact, it intensifies. Consider the taste difference between a fresh tomato and a sundried tomato. The latter presents a much more prominent flavor. The same can be said about dehydrated fruit or peppers. A dried or dehydrated cayenne is far more potent than a fleshy fresh one. Another delicious consequence of dehydrating is a change in texture. Certain meats and fruits convert into a chewy consistency and others, like chilies, become more brittle. Before starting your food dehydrator reviews, it might be fun to taste test samples to figure out which results you like best. Ancient peoples used solar power to dehydrate. Today, you can use an oven set at extremely low temperatures, but this process can be a bit hit and miss. For more consistent results, use a standalone dehydrator. When doing food dehydrator reviews, you’ll discover there are a variety of styles, from cylindrical to flatbed drawers, for example. Read on to learn what’s what about dehydrators so you can figure out which design will suit your needs. If you’re new to the dehydrating trend, then you most likely will want the aid of a timer. Some foods take much longer to complete the process than others, and a timer oversees it, even in the middle of the night while you sleep. Make sure the model you choose comes with a guideline or recipe book indicating various foods’ temperature and time requirements. 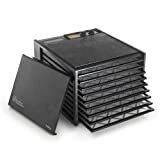 Size really boils down to preference; however, chances are you will not leave the dehydrator out every day, so find one that fits neatly into your designated storage space, but will also hold the amount of food you wish to dehydrate. Something to keep in mind is that you will have to clean and slice the items with each session. Large machines mean larger batches and fewer prepping sessions. Remember, food shrinks as it dries, so what looks like a large amount to start with, ends up being smaller. Nine trays in this drawer-style dehydrator provide 15 square feet of drying space. Set the built-in on/off switch for up to 26 hours if necessary. The polyscreen tray inserts prevent sticking, so removal is a breeze. This design features round, stackable trays, up to 20 total. It has 1,000 watts of drying power as the Converge-Flow technology pushes the heated air down the pressurized chamber and across each tray. The top-mounted fan prohibits liquids from dripping into the heater chamber. Program it to run a maximum 48 hours. Dry fruit, veggies or meat on its five trays or use the fruit roll-up sheet to create healthy snacks. It offers a top venting system, adjustable thermostat and a variable-setting fan to establish suitable airflow.